4G Championship - Which Football Ground has the Fastest Coverage? Not everyone's been a fan of free Wi-Fi at football stadiums. 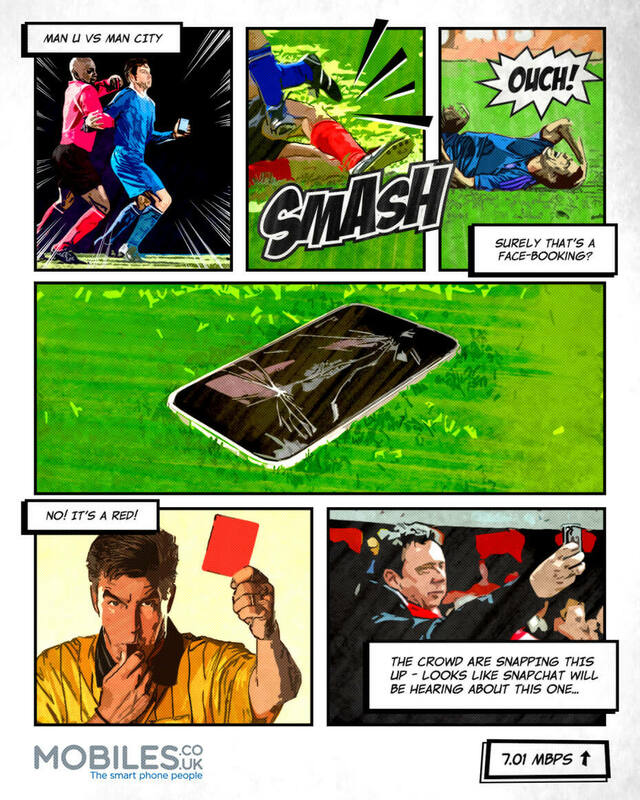 It's a radical thought, but should looking at the pitch be more important than looking at your phone? But football is a group activity – it's just that now you can spread the group a little further, to include the mates who aren't lucky enough to be in the stadium with you. 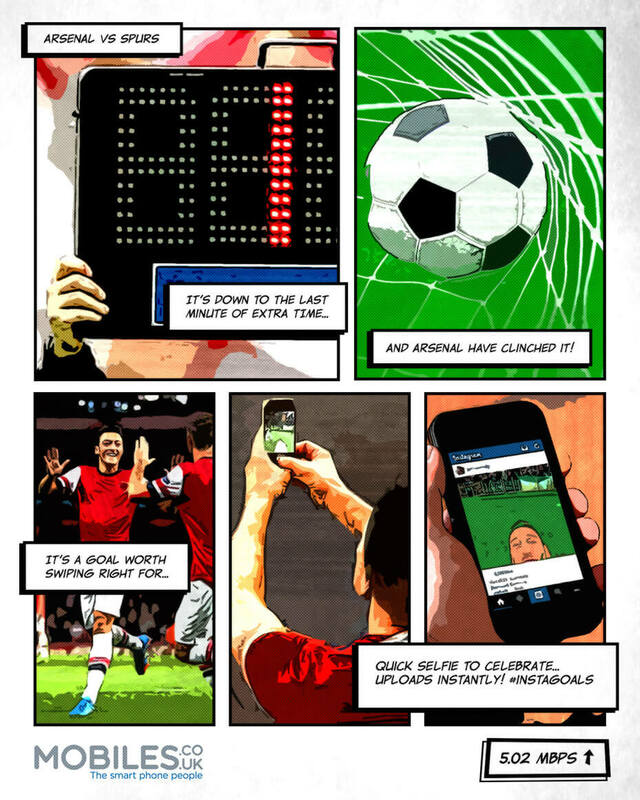 Tweeting scores, capturing the atmosphere on Instagram, maybe a quick Google for some team stats during half time – it's one of those things that's not going to go away any time soon. Free Wi-Fi in every stadium is a long way off, though, so for many the only option remains good old 4G. You can check 4G coverage by postcode using our Coverage Checker, but it wouldn't be very sporting if we didn't turn this into some sort of league-type competition, would it? Who's got the best 4G coverage in the league? Which team is the king of speedy tweeting? It may not be as essential as, say, the players, but it's still pretty important. There's only one way to find out. 20 teams! 380 matches! It's the 4G Championship. All of the teams for the 2015/16 season have been announced, with Bournemouth, Norwich and Watford replacing Burnley, Hull and QPR so, while we're in the studio, let's take a look at what we can expect from the season ahead. You've got your download speeds: how fast you can download things, load pages and refresh app data and the like. Everyone wants to do well there. It's the big headline, it's the home game. But you've also got your upload speed – the often-neglected, low-expectation fixture that is still essential. Your away game and upload performance – how long it takes for your tweets, Facebook statuses and Instagram posts to materialise on your friends' feeds – can decide the season. All the results are in, and it's been a hard-fought season for all 20 teams campaigning to be champions of the 4G Championship. In some cases it's been so close that we've had to settle some final positions on goal difference – the upload speed subtracted from the download speed, because consistency counts – and a couple of teams, like Arsenal, Spurs, and especially Chelsea, have lost out because of their poor upload performance. Despite starting the 2015/16 Premier League as defending champions, Chelsea suffer the embarrassment of being relegated from the 4G Championship by a clear 12 points, while untouchable Leicester have absolutely smashed it. Strong speeds across every network on Filbert Way earns them the title of 4G Champions! Right! Let's get down to it. To speed things along, we'll do the Home-and-Away / Download-and-Upload fixtures together (anything's possible with the internet, you don't need a team bus). The full table can be found below, but we've got a few highlights worth analysing. Bitter rivals, usually slugging it out in the top four, and sure to do the same once again this season, United v City is always a passionate local derby. United may have an unparalleled trophy history and a stadium with really convenient rail links, but what about the 4G? The Reds come out on top as, despite only being a few miles apart, Old Trafford's postcode has a much better download speed than the Etihad Stadium. Result: Three points for United. It's still bad luck for City on the upload speeds, although they put up a much better fight – with only half a megabit per second separating them, tweeting about Touré should be almost as fast as Pinterest with Van Persie. Result: Another three for United. Such a game is surely a foregone conclusion? Last year's league champs and consistent relegation risks respectively, there should be no surprises here. Hang about. Not only have Leicester City destroyed Chelsea's fairly-respectable score, the King Power Stadium also have the best download speed in the entire league? Unbelievable! But fortunate – Leicester fans can distract themselves on their phones as the team takes another pounding on the pitch. Uploads at the King Power are also the best around, but Stamford Bridge has surprisingly low speeds for a London club. Chelsea season ticket holders may get a very respectable download speed at home, but they may struggle a little with getting match snaps posted to social networks in a hurry. Result: Leicester earn another three. Imagine that. It's the North London derby! 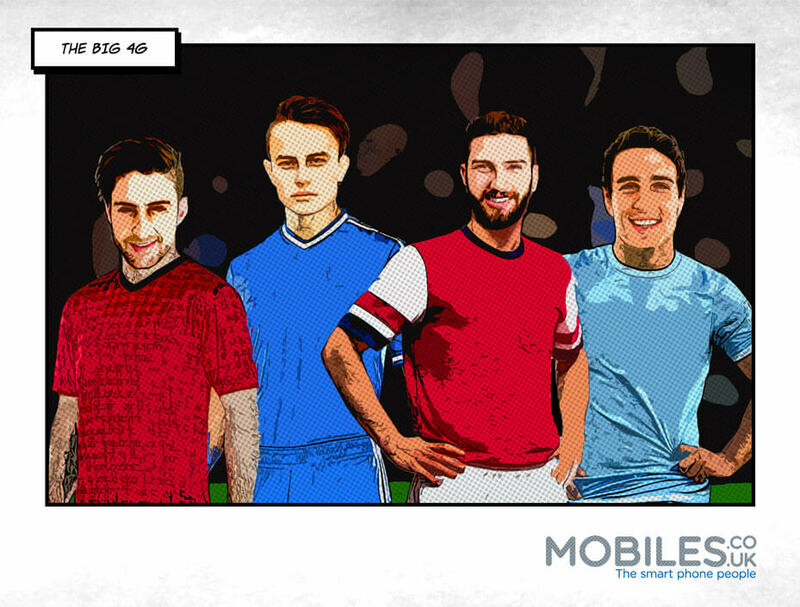 One of the biggest rivalries in football, long-dominated by the Gunners – will the 4G speeds tell the same story? It's a close one! And would you believe it? Tottenham clinch the win by barely a megabit at White Hart Lane. Decent showings from both clubs, though, as you might expect from top-flight football in the capital. Results: A hard-earned three points for Spurs. We don't believe it! It's down to the wire, but the Gunners drive it home in what must surely be one of the closest games of the season! It's a split-second faster for an Instagram post over at the Emirates. We can't say we saw that coming! Results: A truly unexpected three for Arsenal. Southampton had a good season last year; Sunderland not so much. It's never going to be the biggest league clash, but how about in the 4G stakes? Another shocker – the Stadium of Light and St Mary's both happen to be pitched up in postcodes with some very impressive 4G speeds, surely putting them both right near the top of the league? Result: An hard-won three points for Sunderland. Good upload performances for both sides, but Southampton's lets them down a little to give Sunderland another win. Result: Three more for Sunderland. Another classic derby clash! Anfield and Goodison Park are literally just round the corner from each other, so you would expect a close-fought 4G battle at odds with Everton's mid-table standing. Would you believe it! Everton storm the Merseyside download derby by a whole megabit per second – you wouldn't think a mile would make such a difference. Looks like moving out of Anfield 123 years ago has finally paid off. Result: Three points for Everton. Although they do much better on uploads, Liverpool can't catch a break, losing out to their rivals in the final seconds. Result: Another three for Everton. Although it was very nearly a relegation battle in the league last year, and may well be again this season, Leicester and Sunderland are safely in the top flight for 4G coverage! You've already seen them both perform, but put the top two 4G teams side-by-side and you get a first-hand look at how good the speeds at the King Power are across all networks. Results: 4G powerhouse Leicester take three more. 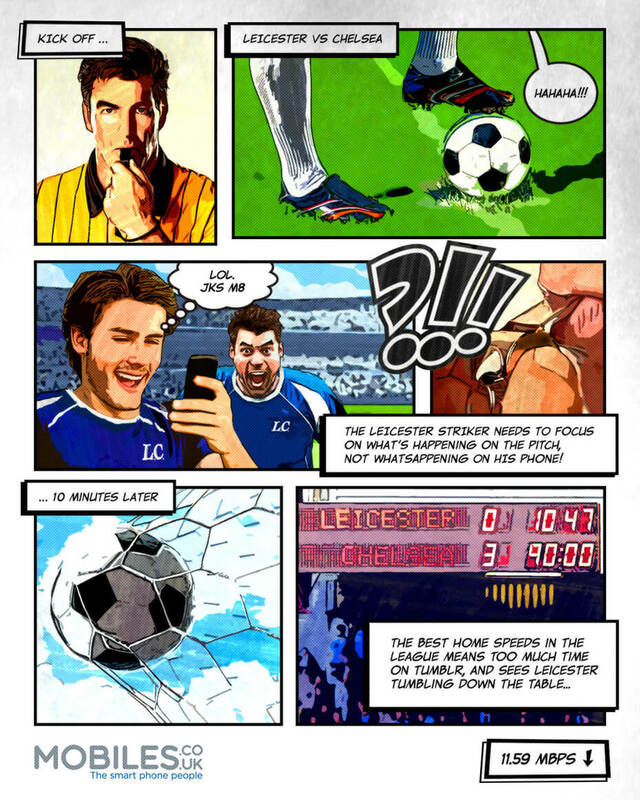 The same is true for the uploads – Leicester fans get the most consistently high speeds across the board. It gives them something to do while their team gets a kicking on the pitch, at least. Result: Another three for unstoppable Leicester. Villa lingered near the bottom of the table last season, whereas Stoke made it in to the top half. Evenly matched when they met head to head, mind, so they'll be teams to watch out for in 2015/16. But how will the mobile speeds compare? It's close for these two, with respectable but still fairly average scores. Villa clinch it with slightly better download speeds at Villa Park compared to the sub-10Mbps performance at Britannia Stadium. Now that's a turn up for the books! Despite losing on download speeds, Stoke claw it back with uploads! That could make all the difference at the end of the season. Result: An unexpected three for Stoke. New to the Premier League, both Norwich and Watford will be out on the pitch with plenty to prove in the Premier League. But can their 4G speeds match the bigger names after a few years out of the top flight? It's unbelievably close! And those are some very respectable speeds, too – it's not just the biggest teams that have benefitted from 4G investment in their areas. Norwich just clinches the win, proving that the far reaches of Norfolk can sometimes outdo London on connectivity. Result: A hard-fought three for Norwich. Another close one, with Norwich just stealing a win once again. If these two can match their league performance in 2015/16 with their 4G download and upload speeds, then they'll be in for a respectable run in the top flight. Result: Three more for Norwich – just. Mid-table stalwarts West Brom should have no problem seeing off premiership newcomers Bournemouth come the new season. But is the 4G at Dean Court worthy of football's highest level? Well, would you believe it – Bournemouth are off to a roaring start in their first ever top flight season. It's not the best download speed in the game, but it smashes West Brom's paltry 8.47Mbps speed, the lowest in the league, comfortably. Result: An encouraging three points for the Cherries. Another shocker! 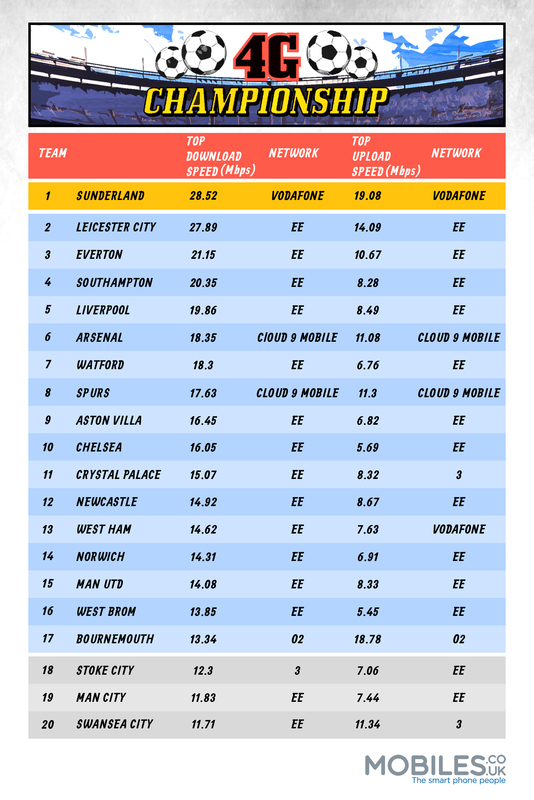 Not only do West Brom have the Premier League's worst 4G upload speed, Bournemouth actually have the third highest! A very respectable performance from the newcomers should see them climbing the 4G championship very nicely indeed. Result: Another three for Bournemouth. Sunderland's performance will be under a lot of scrutiny this season. Potential relegation fodder in 2014/15, but a cracking 4G record. How do they match up against local rivals Newcastle in the Tyne-Wear derby? They may be higher up the league this year, but the Toon's 4G signal at St James' Park leaves something to be desired compared to the Stadium of Light's service. It's a closer-fought battle, but the upload game goes much the same way as the downloads. The tweets are just flying out of the Stadium of Light compared to the sluggish performance at St James. Yet another point of contention for the two clubs to clash over. Results: Three more for Sunderland. This year's top four of Arsenal, Manchester City, Manchester United and Chelsea really don't make as strong a showing in the 4G stakes as they're sure to in the league. United crack the top ten, but Arsenal and City languish mid-table while Chelsea are at risk of mobile relegation. It's strange how things work out, with the biggest, richest clubs in major cities struggling to keep up with the underdogs on network speeds. When it comes to the 4G Championship, a new big four emerges. 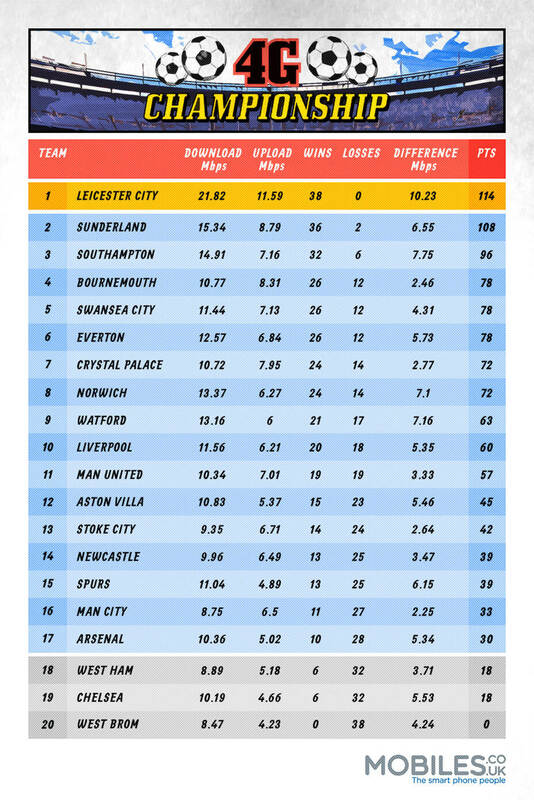 The Big 4G: three world-leading teams in Leicester City, Sunderland and Southampton, whose impressive speeds dominate the table, and plucky up-and-comer Bournemouth, who scrap their way through their first season in the top flight with solid uploads balancing out their download performance. Of course, the final results don't tell the whole story. A team is more than just one player, and overall 4G speeds in an area are down to more than just one network. The scores here are based off the average speeds across all networks, but there's some incredible emerging talent out there in the league, as well as a few that are probably facing a transfer. The fastest 4G speeds in the entire league aren't found at the champion's grounds. The best 4G service in the Premiership is enjoyed by Sunderland fans on Vodafone – the network can reach download highs of 28.52Mbps at the Stadium of Light, and upload speeds of 19.08Mbps! But it's Vodafone's only shining moment – elsewhere in the championship, up-and-comer Cloud 9 Mobile made some promising appearances, particularly in London. But things are, by-and-large, dominated by EE, who provide the best download speeds at 15 of the premier league's stadiums, and the best upload speeds at 13. So why aren't Sunderland top of the league? Well, there's some dodgy performances letting the side down – O2 customers only enjoy download speeds of 2.72Mbps, whereas every network in Leicester offers speeds of 9Mbps or more. Swansea City provide another surprise: the lowest top speed in the championship, despite placing fifth overall for average speeds – the Liberty Stadium is clearly a good, consistent spot for users of all networks. Although supporters chasing trophy-winners is unfortunately common, supporters chasing good 4G connections aren't a big feature in football – yet. Leicester fans may be down on their luck, but at least they can quickly download some games from an app store to take their minds off things. Our Match Report has been created in partnership with OpenSignal who provide a user-generated, real-time, global mobile coverage map. "Interestingly, there's no real correlation between 'points scored' and average attendance, considering the always-on nature of mobile users in this age. Congratulations to Leicester City for winning the 4G speed championship, let's hope this victory in the stands can be replicated on the pitch next season"
Available to download on Android and iPhone devices, the OpenSignal app collects anonymous data on network speeds during regular mobile usage; offering representative data of all times and locations. Information can be segmented by network carriers as well as 4G coverage.